On 4 December 1956, an extraordinary coincidence happened. Elvis Presley, Jerry Lee Lewis, Carl Perkins and Johnny Cash all happened to drop by Sun Record Studios in Memphis, which resulted in an impromptu jam session. The engineer had the foresight to record the session, and it’s now a celebrated event among rock ‘n’ roll fans. On Wednesday of last week, I experienced a similar such meeting. I arrived 15 minutes early for a particular class, but nobody else had arrived after a five-minute wait. I then doubted myself and thought I should perhaps be in another class on the other side of the campus. I immediately headed there. I had to excuse myself through hundreds of other students, coming the other way, aware that time was ticking away rapidly. When I reached the entrance, I happened to meet Classmate A and explained the situation. As we made our way through the crowds, we met Classmate B by chance and brought him with us. As we approached our destination, we happened to see Classmate C, who joined our small group. Had you written either of these situations into a novel, the reader might have some difficulty suspending their disbelief. In short, coincidences don’t work particularly well in fiction, even though they happen all the time in real life. It’s related to the broader deus ex machina, when a seemingly unsolvable problem is abruptly resolved by some unexpected intervention. One way to help the reader maintain that disbelief is to set a few parameters. This could be as simple as dropping a few hints earlier in the story. To demonstrate this, let’s break down my classroom anecdote. My three classmates and I knew we could only be in one of two particular classrooms, so Classmate D had gone to the second room first, since she was just as unsure as me. And although the rooms were at opposite sides of the campus, there is a main thoroughfare that most students would use to travel from one to the other. So the crowds were not a hindrance to the four of us meeting, rather they were subconsciously leading us to each other. If I included this incident in a fictional story with that background detail worked into it – Show, don’t tell, said Elmore Leonard – it’s more likely that the reader would see the meeting as quite a reasonable coincidence. It might even be possible to deconstruct the Million Dollar Quartet in a similar fashion. For a start, the label’s owner had brought along Jerry Lee Lewis as an instrumentalist for Carl Perkins, and Johnny Cash later wrote that he had already planned to see Perkins’ recording session that day. Identify the parameters to help the reader believe those coincedences. This blog has been available at http://www.gavincameron.me.uk since it began last year. But from today, if you type http://www.gavincameron.scot into your browser, it’s no coincidence you’ll also end up here. Last week, Scotland’s voters chose to keep the country as part of the United Kingdom. Rather than make a political post, I’ve decided to take advantage of this country’s moment in the world spotlight to present a few uniquely Scottish words to you. So unique, in fact, that there is no direct English equivalent. I have a strange relationship with the Scots tongue. I don’t naturally speak the dialect, just standard English. Yet if I’m reading a poem written in Scots, I can understand it slowly, and if someone drops a word here or there in a conversation, I’ll be able to recognise it first time. Of the three words below, the top two are in common usage, but I’ve yet to hear the third in the wild. Dreich, adjective. A one-syllable word to describe damp and drizzly weather. The first four letters are pronounced dree, while the last two take the slightly guttural sound found in the name Bach. The closest single-word English equivalents would be dull or miserable, but these could easily be applied to a person or an event, whereas dreich is exclusively for weather. The word sometimes makes it into local BBC weather reports. Skite, verb. Related to skating but nothing to do with that online phone service. To skite is to skim or slide along a surface, usually by accident. It can be applied to a person or an object. In English, you could say slip, but that implies the person or object has fallen over, whereas someone who skites might remain standing. Tartle, noun. This is where a person hesitates while introducing someone because they’ve forgotten the other party’s name. Most sources have this down as a verb, yet the example sentence usually given is, “Pardon my tartle.” In that context, it appears it be used as a noun, although I welcome any corrections. I’m pleased to report that I’ve been given the role of Municipal Liaison for National Novel Writing Month (NaNoWriMo) in Dundee. As well as motivating members, I’m required to arrange meet-ups and participate in the contest. After sending my first bulletin on Friday, we’ve already attracted several new members, and there’s always room for more. I’m equally pleased to brag that I’ve been accepted onto the MLitt Creating Writing module at the University of Dundee, where The Big Music author Prof. Kirsty Gunn and poet Dr. Jim Stewart will help me to improve my work. I matriculated on Friday and I wrote the first draft of this post on campus while showing off my new student card. The two tasks together amount to an awful lot of writing work, but they also have a much less obvious connection. The very first time I matriculated was in 2002 at the University of The West of Scotland, formerly the University of Paisley. During the few days I’d been in town, I quickly became aware of a phenomenon I’d never experienced at home. The people here thought nothing of striking up a conversation with strangers in bus stops, takeaways and even in the street. That’s how I met Billy. I was leaning on the statue at the entrance sorting out the bundle of papers. He might have asked the time, he might have asked for directions, I really can’t remember. But after a little conversation, he suggested we visit the student union bar. I readily agreed. As we made the short walk, I told him about my tiring morning. A member of staff had told me dismissively that the university possessed no record I was coming, so I’d wasted a lot of time making phone calls and tracking down documents and that I was indeed supposed to be there. We passed my bank on the way. I then realised I’d forgotten to pick up my student loan cheque from the university. In the excitement of finding my documents, I’d walked straight out of the door past the finance table. I stopped to mull over the choices: go back and collect it then, or leave it until the afternoon. This cheque would be the only money I would receive during the first term, so I elected to turn back, telling my new friend just to go on and I’d meet him at the bar. I don’t recall being away very long, but he wasn’t there by the time I arrived. In fact, I never saw him again. I’d turned 18, completed my final year of school and moved away from home. Going to university marked the start of an independent life for me, so I sometimes wonder how differently it could have been if only I’d left the cheque until the afternoon. Would making the opposite decision have meant Billy and I becoming good friends? Might I have fallen in with a different crowd of people? And it’s this type of question that I plan to explore in my NaNoWriMo novel, although on a larger scale. Namely, What if the petrol engine hadn’t been invented until 1999? The What if? device is a powerful one in fiction. What if the Germans had won World War 2? What if Charles Babbage had completed his Difference Engine? What if an asteroid hadn’t wiped out the dinosaurs? I know where I’m going with the start of the book, and I’ve a clear idea how it finishes. It’s just the 49.000 words in between I need to find. To do this, I plan to adopt the same What if? device. I’ll write down the theme on an A1 sheet of paper, and all the words associated with it. For each one, I’ll then ask But what if? and combine it with a little historical research to fill the gaps. Drawing charts or creating physical artefacts are not my usual method of planning, although for my 2012 piece, I built a model of one of the settings to keep its description consistent. I’m itching to start, but the rules don’t allow you to write the actual story until 1 November, so it’s one of the few things I can do right now. There’s only a month and a half to wait. Many authors find it difficult to name characters. It’s not just a case of finding a name you haven’t used before; it has to be consistent with the person’s age, region, class, &c.
My names normally come very quickly, but in my novel The Government Artist, it took weeks to find the right moniker. The main character is a man born in 1943 who could potentially have gone to Oxford University. His name became Malcolm St Clement, which has a certain easy rhythm and suggests he’s from a fairly well-off family. But what about the names given by peers rather than parents? In the TV series NCIS, Dr Donald Mallard is universally known as Ducky, an affectionate term that plays on his first and last names. By contrast, Agent Gibbs is the boss, and addressed only by his last name as a mark of respect. The only exception is Ducky, who is allowed to say Jethro. It implies the two have a relationship that predates Gibbs’s appointment, and perhaps his tolerance of being addressed so informally is a mark of his own respect to Ducky. It can also speak volumes about a character whose nickname is not used, at least not to his or her face. In another of my books, Fifty Million Nicker, Josh “Speedy” Rush works in an office where affectionate titles are given to everyone. However, his colleague calls himself Pressure Pete as he’s proud of his harsh sales tactics. Nobody else calls him this, preferring to use names that range from Pete the Pain to Pete the Prick. One of their bosses is also unkindly known as Tart, taken from her first name Flanella. In a few cases, the nickname can say more about the person who bestowed it than the recipient. I have a real-life example from people I knew a few years ago, so I’ll have to change the actual names used. Person 1 was called Callum, but Person 2 had only just met him and struggled to remember his name. One day, P2 accidentally called him Logan. Even though this was an isolated mistake and he finally learnt Callum’s correct name, P2 continued to nickname him Logan, trying to make it catch on. He persisted for three years, and nobody else ever used it. If there is one name I should use more often, it’s Jeffery Archer. I don’t know exactly why, but last week’s post gained twice as many views as normal. Do keep it up. How To Edit Like Jeffrey Archer. Firstly, let’s move some issues out of the way. There are many people who don’t like Jeffrey Archer, either as a person or as a novelist. But he is a very popular author, with at least 250 million books sold worldwide, and his advice regarding editing is faultless. He’s stated in the past that he likes to redraft his work up to 14 times, and he usually does so in longhand. I wondered what would happen if I subjected my own words to the Archer treatment. To do this, I needed a passage that had never been edited, and I found one in notes from an old writing class. I’ll label that passage Revision Zero. The prompt was a photograph of a baby in a sidecar. I wanted that bike, that particular one, the shiny black Yamaha, with the sidecar. You rarely see sidecars these days, so there was only one place that could help me with that, but it was worth the trip. Six months ago, I was driving in the countryside and I had my son with me. As we were finally picking up speed, I swerved to avoid a pothole and the nearside wheel hit a deep ditch. We both went flying into a field and only missed the fence by a few inches. We were lucky we didn’t suffer bad injuries, but it was the first accident I’d had in thirty years of driving. So with this new bike, the identical one, I go up and down that road with him again as often as I can, being careful at that part. I’m trying my hardest to block it out. The more I do it, the more I drive that route, the more it never happened. 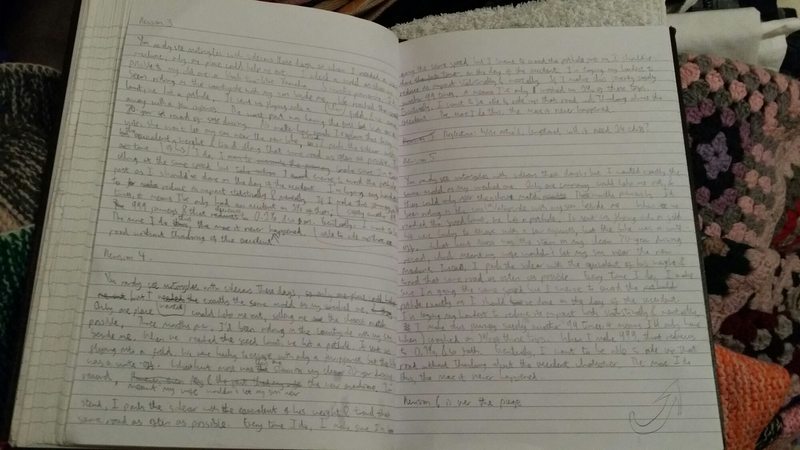 For each redraft, I copied out the passage from start to finish into my notebook (pictured), making corrections as I went along. This was an unusual and quite time-consuming method for me, as I generally make only first drafts in the notepad then copy my work into a computer. Often I simply type the first draft. Let’s see how this passage has changed by Revision 3. You rarely see motorcycles with sidecars these days, so when I needed a new machine, only one place could help me out. I ordered a model as close as possible to my old one: a black two-litre Yamaha. 3 months previously, I’d been riding in the countryside with my son beside me. When we reached the speed limit, we hit a pothole. It sent us flying into a field, & we came away with a few injuries. The worst part was having the first blot on a 20-year record of safe driving. No matter how much I explain this to my wife, she won’t let my son near the new bike. Instead, I pack the sidecar with the equivalent of his weight & travel along that same road as often as possible. Every time I do, I make sure I’m travelling at the same speed but swerve to avoid the pothole just as I should’ve done on the day of the accident. I’m trying my hardest to reduce its impact statistically & mentally. If I make this journey safely another 99 times, it means I’ve only had an accident on 1% of them; 999 journeys & that decreases to 0.1% & so on. Eventually, I want to be able to ride up that road without thinking of the accident. The more I do this, the more it never happened. Revision Zero was written in May, and all subsequent revisions were made in August, during which time I hadn’t thought about the piece. Already there are improvements. I’ve expanded on his inner conflict between his want to be a perfect driver and the accident that overshadows this. The introduction of his wife creates a second conflict, this time over whether his son is allowed to ride with him. That conflict isn’t explored quite so much, but its outcome is clear. Perhaps the character is too caught up in his inner conflict to care much about the external one? He might even be in denial about it, which seems consistent with his mindset. Now let’s explore Revision 6. You rarely see motorcycles with sidecars these days, but I wanted exactly the same model as my wrecked one. Only one company could help me out, and even then, I had to make do with an approximate match. Three months previously, I’d been riding in the countryside with my son beside me. When we reached the speed limit, we hit a pothole. It sent us flying into a field. We were lucky to escape with few injuries, but the bike was a write-off. What hurts more was the stain on my clean 20-year driving record, which meant my wife wouldn’t let my son near the new machine. Instead, I pack the sidecar with the equivalent of his weight & travel that same road as often as possible. Every time I do, I make sure I’m going exactly the same speed, but I swerve to avoid the pothole just as I should’ve done on the day of the accident. I’m trying my hardest to reduce its impact by statistically & mentally. When I make this journey 99 times, it means I’ll only have crashed on 1% of these trips. When I make 999, that reduces to 0.1%, & so forth. Eventually, I want to be able to ride up that road without thinking about the accident whatsoever. The more I do this, the more it never happened. I was initially aiming for 14 revisions. By the time I reached that point, however, I began to feel I would be revising for its own sake when the point of the exercise was to make only necessary improvements. I finished Revision 6 a few days ago. Plot-wise, it doesn’t differ terribly from Revision 3, but the sentence structures do. Looking at it today, I would only change the ampersands into proper words and make minor alterations to some of the sentences. And that’s one of the key techniques for revision: leave it a few days. Many writers are keen to submit their work as soon as it’s rewritten, but it’s a good idea to leave it for a day or two and revisit it. Archer might revise his work 14 times, but not at one sitting. The rewriting process will help to tighten up any first draft, and you’ll probably find errors you didn’t realise were there. A good way of checking the punctuation and grammar is to read the paragraphs in reverse order so you don’t follow the story. The very best way of picking up all kinds of mistakes is to ask someone else to read it. A professional proofreader is best, but even a friend’s insight can be invaluable, and less expensive. After all, a publisher or an agent needs to be hooked from page 1, and if the first thing they notice is careless writing, that piece will go straight to the rejection pile. On the other hand, a little revision now might set you on the road to selling 250 million of your own books.